‘CBA believed it had handled the situation adequately.’ ‘What kills banks is hubris,” says Brian Johnson, one of the country’s most respected banking analysts. They are five simple words but they strike at the heart of what can ultimately destroy a company – no matter what its size, its political clout or its storied history. Johnson was referring to the various twists and turns in the Commonwealth Bank financial planning scandal that was exposed by Fairfax Media a year ago and culminated last week in a Senate inquiry calling for a royal commission. It took the bank’s chief executive Ian Narev seven days to come out of the bunker and address the explosive report from the Senate. His appearance came after significant political pressure from Finance Minister Mathias Cormann, who is trying desperately to save his Future of Financial Advice (FoFA) amendments from a sudden death. The CBA scandal has become emblematic of what is wrong in the financial planning industry, specifically the inherent conflicts of planners tied to or working for the banks. To that end the scandal has become a powerful weapon against Senator Cormann’s financial advice regulations. It isn’t surprising then that he wants CBA off the front page so he can spend next week lobbying Clive Palmer to back his regulations rather than join the opposition and Greens in disallowing them. Narev responded to the Senate report and the negative media publicity with an apology and a compensation package that ”will not be material for investors”. Nor does it offer compensation for pain or suffering to customers for the years of suffering or a review of the management ranks. Given the lack of ”materiality”, the announcement had no impact on the bank’s share price. But it did prompt enormous discussion about Narev’s attitude, the board’s handling of the situation and the long-term damage to the brand. This has manifested itself in various ways including the emergence of various class-action law firms preparing to mount class actions against the bank, a move by some independent financial advisers to stop selling CBA ”Colonial” branded products after a backlash from customers, and last month a financial advice firm Ethical Financial Advice defecting from the bank’s Financial Wisdom umbrella to a non-aligned licensee as it was attracted to the dealer group’s ”non-conflicted” nature and advice provision philosophy. Indeed, Johnson, who works for CLSA, released a report that said while it might be tempting to dismiss the issue as ”immaterial”, ”the reality is this response is driven by CBA’s efforts to avoid a potentially expensive, disruptive and potentially a far more wide-reaching royal commission into the issue”. It is yet to be seen whether Narev’s and the board’s response is enough to bury a royal commission or judicial inquiry. What is known is his address on Thursday did not discuss allegations of forgery or fraud or a cover-up by managers. Nor did he explain why some of these managers and planners are still employed by the bank. To ASIC the scandal happened in the past and until Thursday CBA believed it had handled the situation adequately. Whether this is hubris or arrogance rather than a culture of ”defensiveness” is something to explore. But a letter sent to Narev by one of the bank’s victims, Jan Braund, on January 9, 2013, five months before she took her story to Fairfax Media, suggests the bank might have averted some of the negative publicity if it had taken her letter seriously. In the letter, which included various documents to back up her allegations, she talks about her experiences of having her signature forged on documents, and she names other victims who have had similar experiences. Don Nguyen was banned by the corporate regulator ASIC in 2011 for seven years. Jan warned Narev she had the drive to expose what happened, to see persons compensated and for this not to happen again. ”Those that have destroyed and manipulated documents (or have covered it up) should be dealt with by the proper channels.” Weeks later a letter arrived from Brendan French, the general manager of group customer relations, saying he was writing on behalf of Narev ”so please accept this letter as our formal reply to you”. French didn’t respond to the allegations. He said the bank had settled her complaint, she had signed a deed of release and ”while we welcome contact from you on issues unrelated to this matter, we do not believe it would be proper to continue this particular correspondence and so will not respond further”. Five months later Fairfax Media exposed the scandal inside the CBA’s financial planning arm, which triggered a Senate inquiry. The bank preferred to keep a low profile on the various media reports that came out, saying it happened in the past, the bank had spent millions improving its systems, new management had been installed and the scandal was contained to a few bad apples rather than being systemic. Chairman David Turner has not publicly addressed the issue. Nor have risk committee head Harrison Young and long-running CBA director Andrew Mohl – whose tenure reaches back to 2008. It is now up to the bank to make good on its promises to customers and take steps to ensure it doesn’t fall victim to hubris and arrogance. Everyone will be the loser if it doesn’t. ADELE FERGUSON The CBA scandal has become emblematic of what is wrong in the financial planning industry. BEN BUTLER AND ERIC JOHNSTON Although each crisis is different, ultimately for banks trading on trust, the response needs to be severe. 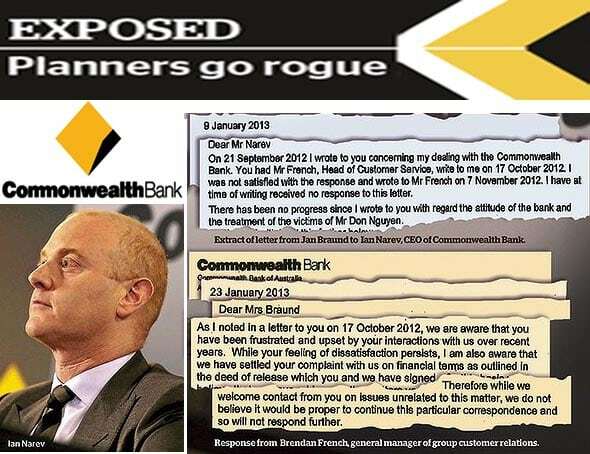 ADELE FERGUSON, BEN BUTLER The Nationals senator key to last week’s bombshell report into fraud, forgery and a cover-up in the financial planning division of the Commonwealth Bank has called for a royal commission on white collar crime as shockwaves from the debacle spread to other banks. MADELEINE HEFFERNAN Response feeds into a public perception of arrogant banks, according to a public relations expert. MIKE CARLTON It took far too long, but finally the Commonwealth Bank has been dragged – screaming and kicking all the way – to admit that it ripped off thousands of customers who had sought financial advice over almost a decade. MALCOLM MAIDEN Pressure on the CBA to respond to the devastating Senate Economics Committee inquiry into its financial planning ramped up on Wednesday. ERYK BAGSHAW Victims of the Commonwealth Bank’s financial planning scandal are outraged at the bank’s response to the Senate inquiry and are demanding a royal commission still take place. JEFF MORRIS My phone rang this morning at 9am. It was Ian Narev, the CEO of CBA. It is a call I have been waiting nearly 6 years for now. BEN BUTLER The Commonwealth Bank’s $7.8 million-a-year chief executive, Ian Narev, was in Indonesia on a family holiday during the financial planning crisis that has gripped Australia’s biggest financial institution for the past week. GEORGIA WILKINS Lawyers representing victims of the Commonwealth Bank’s financial planning scandal have questioned the bank’s new compensation scheme, saying it fails to pass the independence test. BEN BUTLER AND NASSIM KHADEM Treasurer Joe Hockey has signalled he may not be in favour of a royal commission into Commonwealth Bank over financial planning misconduct. BEN BUTLER Mystery surrounds the whereabouts of Commonwealth Bank chief executive Ian Narev during the financial planning crisis that has gripped Australia’s biggest financial institution for the past week. ADELE FERGUSON AND BEN BUTLER Commonwealth Bank chief executive Ian Narev has bowed to community, industry and government pressure over the financial planning scandal by announcing a new compensation scheme for victims this morning. ADELE FERGUSON AND BEN BUTLER Financial planners at the scandal-plagued Commonwealth Bank are still raking in lucrative commissions and fees for tipping their clients into $3.2 billion so-called ”zombie funds” that have been frozen for six years. Commonwealth Bank boss Ian Narev will front the media for the first time since a damning report called for a royal commission to investigate its financial advisers. ADELE FERGUSON AND BEN BUTLER The country’s peak body representing financial planners has taken a stand on the Commonwealth Bank, saying it will support a royal commission into the bank unless the bank agrees to form an independent committee to oversee a “full and fair” compensation process to customers affected in the financial planning scandal. ADELE FERGUSON, BEN BUTLER Pressure on bank tellers to push customers into Commonwealth Bank financial products such as insurance and managed funds is causing stress, depression and bullying, according to an explosive new survey of staff. BEN BUTLER The Abbott government has gone ahead with its controversial roll-back of protection for consumers of financial advice despite a damning Senate report into the Commonwealth Bank financial planning scandal. GEORGIA WILKINS Commonwealth Bank chief executive Ian Narev has broken his silence over a scathing Senate inquiry report that called for a royal commission on fraud.